Comments/Bug reports welcomed and appreciated! Bugfixes get the highest priority. Once you report one, it will get fixed/solved in a time frame that can be measured in hours. 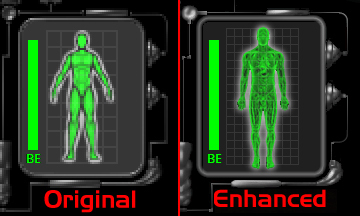 Deus Ex Enhanced v2.1.0 Sneak Peak! Here's a sneak peak of the upcoming v2.1.0. It will feature retextured HUD elements in high resolution detail, while maintaining the style and size of the original textures. Deus Ex Enhanced v2.0.0 is released! Use 7-zip to extract. Readme and changelog file included. Is this compatible with GMDX? Is it possible to use this with Revision? That health model looks so good, too bad this mod is dead. i have it set at my native resolution but it looks zoomed in any idea how to help it? In short, it presents a coherent high-definition UI, and is compatible with current versions of most common Deus Ex mods. Why on earth would you make a mod that solves the GUI problems but forces the use of shifter????? Bundling mods is an awful idea, can we get a version with no other third party mods like shifter?